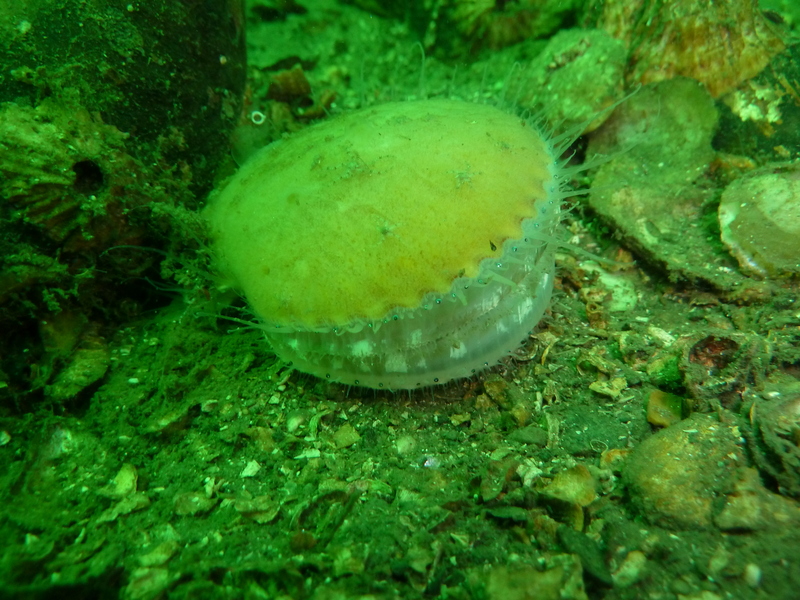 A small team of Izzy, Gary and Chris, met at Colin’s and were joined by Frank, a guest for a trip across to the West coast to explore a couple of sites, that as a club we don’t dive that often. After a short detour to Puffin Dive Center to pick up a set of regulators we headed North to a site know as “the Steps” on the south shore on Inner Loch Creran and arrived to find blue skies, a flat calm loch and temperature soaring into the 20s. Was this the start of summer we asked ourselves as we kitted up and then sweated profusely awaiting our turns to dive. Today’s plan was to dive in waves with the shore cover also minding Hamish (the dog) who on arrival had immediately found a grass snake so was keen to explore the brambles and under growth for other exciting residents. On entering we were met by a swarm of Moon Jellyfish which distracted us for a minute or two before we pressed on. Once out of the little bay, the bottom shelves steeply over a bed of Horse muscle shells and then over a set of little steps before flattening where mixed sand and rocks and ultimately sand or gravel takes over. 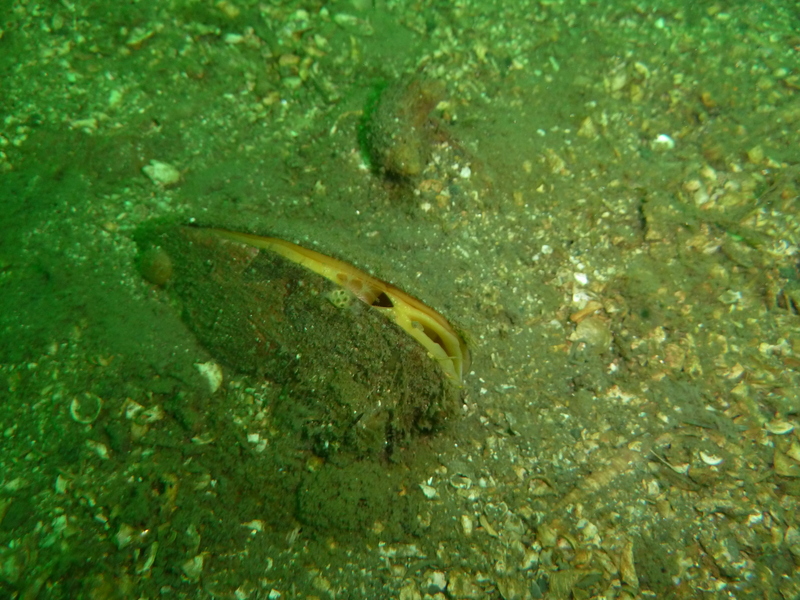 A small wall or reef to the left of the bay provides a good substrate for squidgy life and at its base large numbers of queen scallops had gathered that flew off as we disturbed them. Not much fish life around today apart from the ubiquitous Gobbies. Having descended to the foot of the wall in what can be described as superb visibility, we took a clockwise circuit across the mouth of the bay where a field of sea cucumbers and small rocky slabs covered in Green urchins and a solitary fireworks anenome provided interested before we eventually ascended to the base of a boulder slope. 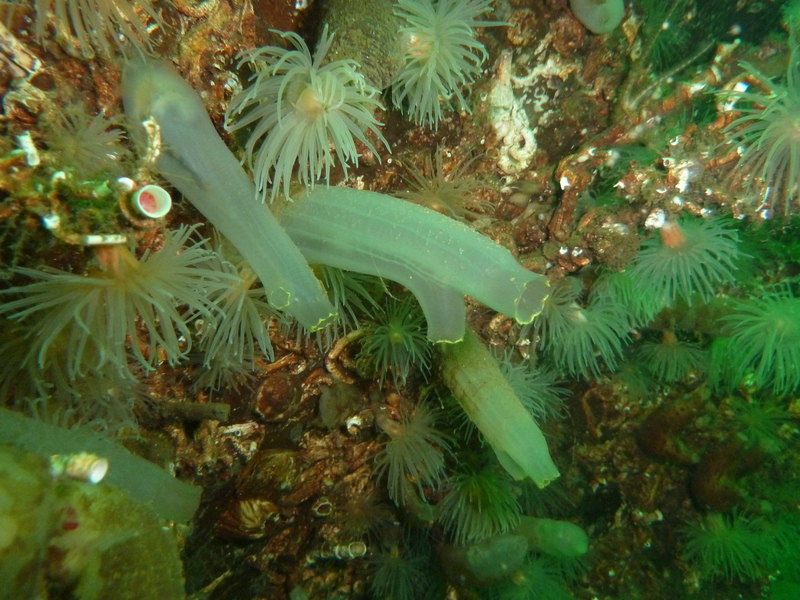 It was here that we found the beastie that we had come to see, the Sepulid worm that forms rare biogenic reefs. We found them, but you have to be a cunning photographer to get a good snap, if they detect any movement or noise from your exhaust bubbles, they snap back into their tubes. Needless to say I took several excellent photos …. of the worm tubes…. To make the most of the sunshine the barbecue was lit and a few sausages burnt before we moved sites stopping off at a very pleasant cafe at Columba Bay where we sat outside enjoying the sun. The second dive site was the Bonawe Quarry site on the North shore of Loch Etive, here we were going to look for the little wreck of the fishing boat, sometimes know as the ‘Kingfisher’. This proved to be a bad choice as the breeze was blowing directly into the harbor and the visibility proved appalling. 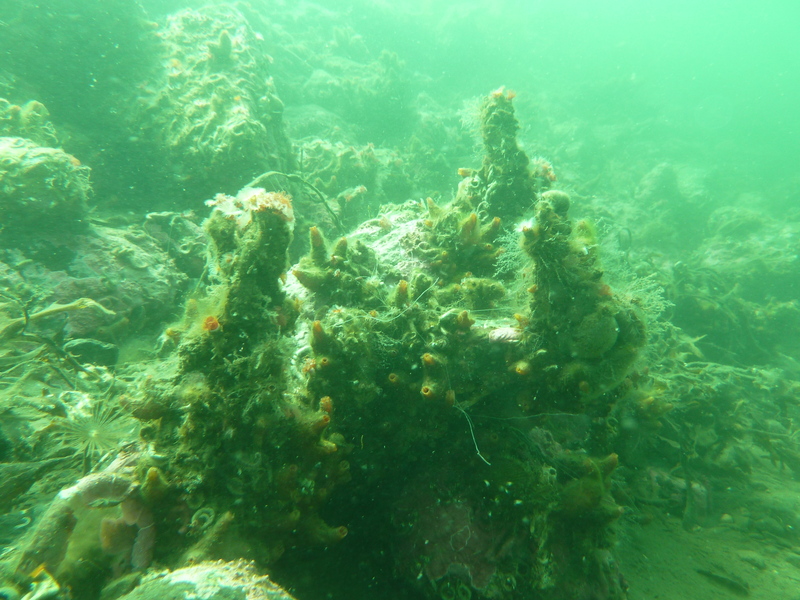 The first wave went in and very quickly came up again to inform us they were changing their dive plan to investigate the rocks of the causeway. They surfaced to report finding the old car wrecks but visibility of less than a meter. Not good! The second wave went in and were somewhat luckier, finding the running line that links the shore to the derrick and then the wreck. The derrick was found, with someone’s head, before moving on to the wreck where a slow clockwise circuit was made being very careful not to stir up the bottom. Unfortunately we weren’t careful enough and having got around the A frame at the stern of the wreck we re-entered our silt trail and decided to take a compass bearing to the causeway and work our way back via the cars to the entrance point. 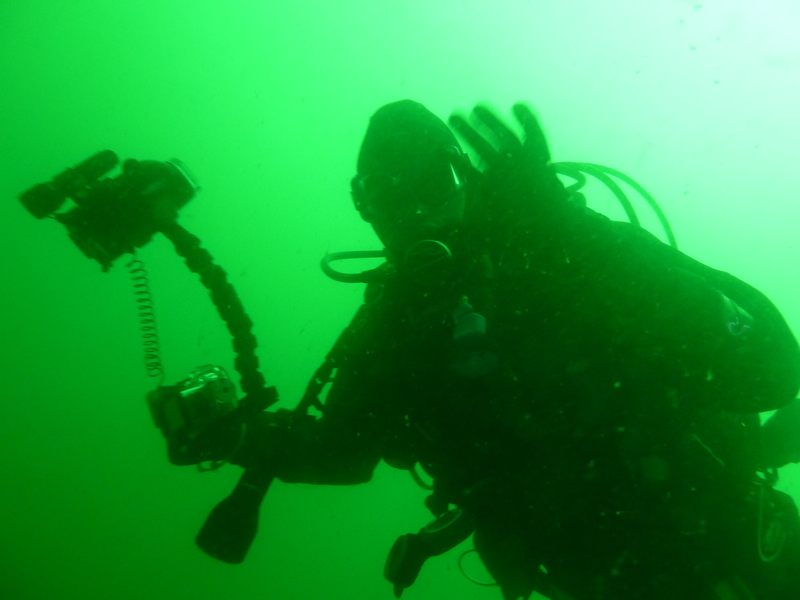 All in all a very dark, low vis but atmospheric dive but certainly not the worst one I have ever done. As everyone was getting rather hungry we decided to stop at the Crianlarich Hotel on the way back for a spot of supper. This is proving to be a regular stop, being about half way home and providing a friendly and convivial atmosphere. Salmon, venison and Cumberland sausages were ordered and the stalkers dispatched while we waited non to patiently for our tea. After some lively banter all fell silent as the important business of food was resolved, a process that didn’t take too long. With dinner finished all that was left was the remainder of the trip home and washing the gear off. Certainly a day of two very different dives and hopefully the start of some long overdue Summer weather. Thanks are due to all who came along and made this trip possible.